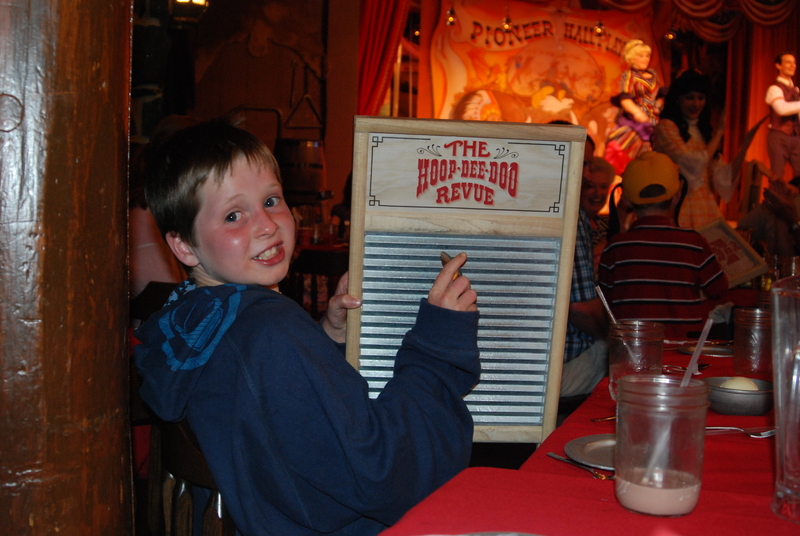 Following on from my last blog, “Disney Beginnings”, where I reminisced about my first experience of the evergreen “Hoop Dee Doo Revue”, a thought occurred to me; “What puts the ‘Hoop’ in the ‘Dee Doo? '”, and makes us all keep coming back for seconds, thirds, and so on and so forth? The revue began it’s very long and illustrious run of shows in 1974, (according to Disney, it is the longest continually running musical in the whole of the USA) and was originally billed as “The Pioneer Hall Show” so names after the hall in which it is held three times nightly within the Fort Wilderness Resort and Camp Ground. Today’s show title is far more memorable and quirky don’t you think?! I can also recall a similar show being held at the “Diamond Horseshoe” at Frontierland in the Magic Kingdom during 1980’s. I remember it so well as I took part in it dressed as a showgirl, and had to speak with a Southern drawl; not an easy task for a Cornish maid I can assure you! The Hoop Dee Doo is a rowdy family affair dinner show that is sure to entertain from the youngest little dude in your gang, right up to to the oldest cow poke in town! Good old fashioned clean cut comedy is certainly part of the winning formula that keeps you coming back for more belly laughs and groans year after year! The show revolves around a fictional travelling vaudeville troupe who are; Miss Flora Long – a beautiful maiden, Miss Claire De Lune – a delightful dancing girl, Miss Dolly Drew – a witty wholesome gal, Jim Handy – a dashing cowboy, Johhny Ringo – a swanky card shark spiv, and then the chap, who for me carries the whole show along with such gusto, Six Bits Slocum, who is a loveable buffoon. The action starts as the cast bursts in through the main doors……immediately you are captivated by their enthusiasm and charisma which carries right on through with lots of sing-a-long songs and high kicking dance routines culminating in the deliciously ridiculous “Davey Crockett” grande finale involving several “volunteers” from the audience! Your show ticket gives you as well as the revue, dinner, plus a broad selection of drinks and is inclusive of all gratuities. And what a heavenly dinner it is……I think that “endless banquet” is probably a better description for the chow down at Pioneer Hall! Your jovial servers, upon request will keep replenishing your table with endless supplies of the lightest cornbread, the stickiest ribs and the crunchiest deep fried chicken you’ve ever eaten, all served in pioneer style tin pales! Dessert is a show stopping strawberry shortcake extravaganza! And “Where else on earth?” I ask you, would it be socially acceptable for a lady to drink rose wine from a preserves jar?!! I’ve watched and enjoyed the revue several times since my initiation in 1979 and each time come away feeling uplifted, not to mention full to the brim of food glorious food! Over the decades this booming show hasn’t changed one bit, and neither really have I or my family. We go along in holiday mood wanting to have a laugh and good time with those we love, being entertained by characters we’ve come to know over the years, in a setting that is cosy and familiar. So, I believe that’s the answer; we the audience are the “Hoop” and the perfect partner for the Pioneer Players to “Dee Doo'” time and time again. If you asked Six Bits for his opinion I bet he’d answer you with something like “If it an’t broke, don’t fix it!” And, I pray that Disney never will! This entry was posted in Real Disney Mom Janie GD and tagged Claire De Lune, comedy, Cornbread, Cornish, Davey Crockett, Dinner Show, Disney, Disney Beginnings, Dolly Drew, entertainment, family, Flora Long, Fort Wilderness Resort and Camp Ground, Frontierland, Golden Horseshoe Saloon, holiday, Hoop Dee Doo Musical Revue, jam jar, Johnny Ringo, laugh, Magic Kingdom, musical, Pioneer Hall, Pioneer Players, showgirl, Six Bits Slocum, The Pioneer Hall Show, USA, vacation, Vaudeville by therealdisneymom. Bookmark the permalink. You lucky chap Jerry, best seats in the house too – I only wish my thursday night had been so exciting! !